F​or Sale​: 2 Portable pre-wired acoustic mic pre-amp setups with reverb. This is the culmination of a lot of gigging experimentation with different combinations of pre-amps, microphones and reverb units. These are studio quality setups packaged in water-tight, very portable flight cases. Our goals when putting these systems together were: super fast setup (with all settings retained), as much volume as possible with a mic setup before feedback, zero latency and extremely accurate, transparent amplification of an acoustic guitar. Everything is hand wired with top of the line studio quality Mogami 2549 cable (over 48 hours of wiring labor alone). The boxes are wired for either Mic or Pickup use with both XLR and 1/4” inputs. 1. Audio-Technica ATM350 clip-on condensor microphone (AT8444 mic clip included, $30). The ATM350 is the upgraded pro version of the popular AT Pro-70 that many Gypsy guitarists use and normally sells for $280. 2. 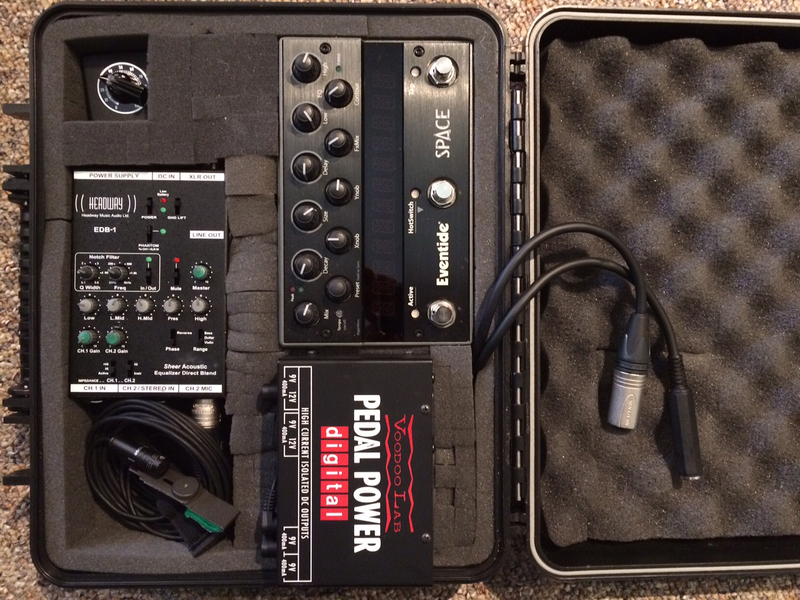 Headway EDB-1 2 Channel Mic/ Pickup Preamp, EQ & Direct Box which normally sells for $320. The unit has an adjustable notch filter and variable high pass, in addition to the 5 fixed EQ filters. These filters are critical for removing feedback. All internal wiring is audiophile grade, Class-A. The unit also has, on-board phantom power, mute, ground lift, phase reversal and separate gain levels for mixing the mic and pickup channels together. 3.Eventide Space Reverb which normally sells for $500. It has 99 programmable reverb / delay combinations that cover every reverb type. This is the ONLY portable digital reverb unit on the market that doesn’t add latency and digital artifacts to the sound. 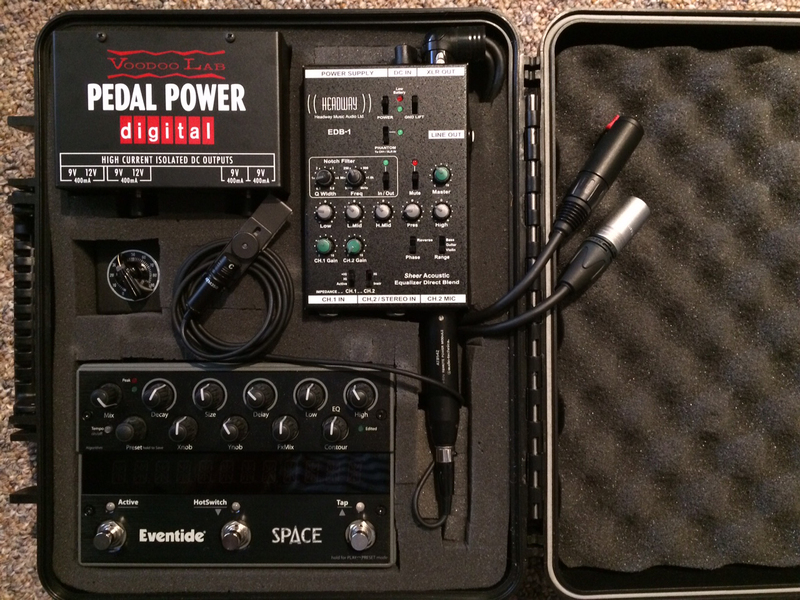 Eventide Space is the BEST sounding reverb pedal available. 4.A custom passive mixer is wired between the outputs of both the Eventide and Headway units allowing the reverb signal to be blended directly with the Headway output. This passive summing of the signals while in an analog state keeps the direct mic signal perfectly intact and free of digital conversion, remaining clear and loud. This approach is uncommon in normal guitar setups, but, is a highly regarded practice within the professional audio community and well worth the extra labor involved. 5. 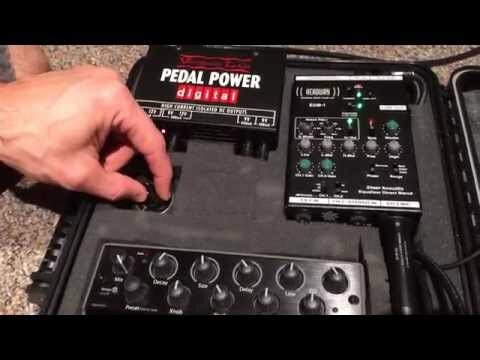 A Voodoo Lab Pedal Power Digital (normally sells for $140) supplies clean conditioned power to all the internal components. In addition to stream-lining the power setup, we have found that this unit provides significant improvement in volume, clarity and tone verses factory power supplies or batteries. 6. 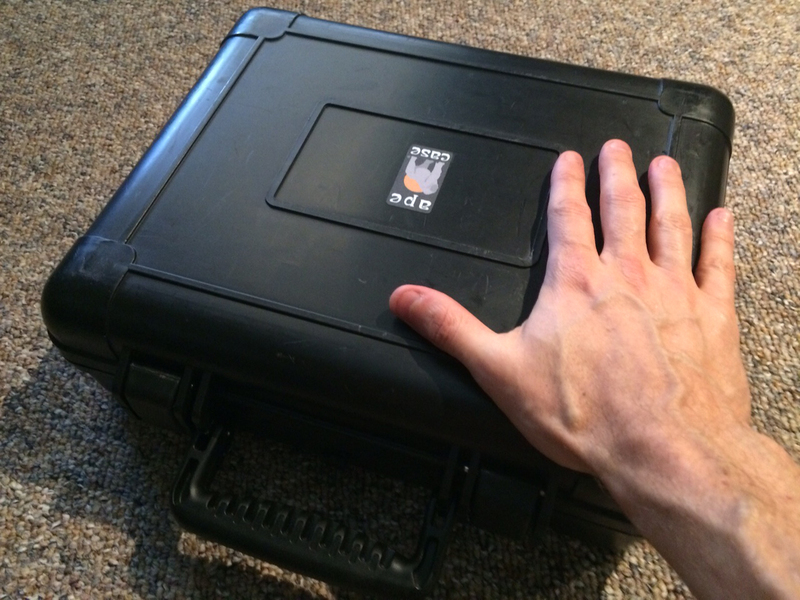 Lastly, everything is containing in a compact, light-weight, water-tight flight case with a 90 degree hinged lid (Ape Case ACWP6025, $80) and protected by flight case foam. This super efficient setup is designed to be opened and set on the floor beside the guitarist allowing instant access to all controls. Two connections (power and output to amp and/or PA) are all that’s necessary to be up and running. We’ve very recently had to purchase a much larger, full scale digital PA. Consequently, these units aren’t seeing as much use. We have received so many positive comments about them from both audio technicians and musicians alike. We’ve also on several occasions, been asked to build copies for others. Consequently, rather than parting them out, we’re hoping to sell them intact. All equipment is less than a year old and is in excellent, perfect working condition. Over $1500 in new materials alone with also roughly 50 hours of labor in each box.